The association of Chopin and dance seems almost an inevitable and aesthetically creative combination. A predominant proportion of his compositions are dance music or at the very least contain embedded Polish dances - waltzes, mazurkas, regional dances and polonaises. I have noted two general ways that I feel pianists approach these piano pieces. One may approach them as if composed in the glow of romantic nostalgia for the missing past joys of the dance. The great Russian pianist Dimitri Alexeev brings this warm affection especially to the Mazurkas. Chopin certainly experienced this yearning emotion after he left Warsaw where he was known to be a passionate dancer as a young man. The other general approach concentrates, it seems to me, more on a recreation through the filter of time, the folkloric and rural elements, the lively rhythm and 'snap' of many mazurkas, the sometimes strange countrified harmonic relations he explores so creatively. Chopin would have experienced at first hand the rather energetic, even rough, folk dancing in Mazovia. These reflections were uppermost in my mind as I approached the majestic columned entrance of the Polish National Opera Theatre in Warsaw. Orchestrations of Chopin piano pieces have been popular with many composers (even Benjamin Britten), but this is the first time that his two youthful piano concertos have been conceived as a ballet by two eminent choreographers (one English and one Polish). One might ask why these exuberant works of the young Chopin have not been considered before. Chopin in his youth was mad about dancing, a fine dancer himself and also an excellent dance pianist, often playing into the small hours. Party exhaustion even required a period of rehab recommended by his teacher Józef Elsner at Bad Reinherz in Silesia – now the Polish spa town of Dusznki Zdrój. Perhaps it is the length of the concertos and lack of narrative element that has dissuaded choreographers. Of course we are all familiar with Les Sylphides, a short, non-narrative ballet blanc. Michel Fokine was the original choreography, Chopin's music orchestrated by Alexander Glazunov. In 1892 Glazunov had already arranged an orchestral suite of Chopin entitled Chopiniana his Op. 46. 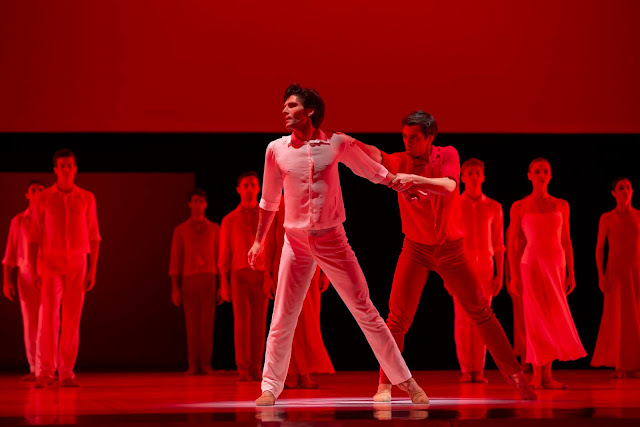 The American choreographer John Neumeir's Lady of the Camellias which I greatly enjoyed in Warsaw, also comes to mind. In this year celebrating the 100th anniversary of the regaining of the Independence of Poland, the idea of a ballet setting of the concertos seemed an inspired one. Liam Scarlett is the artist in residence at the Royal Ballet in London and artistic associate with Queensland Ballet in Australia. As a young man he was fascinated by the choreographic possibilities of the piano and attracted by the smaller piano works of Chopin. He had always loved the beauty of the concertos but thought the difficulties of setting them as a ballet a particularly significant challenge. As an Englishman he did not feel a need, or even the presumption, to tie the E Minor Concerto to Polish history. He felt it should be simply a joyful, happy and free celebration of independence. In ballet one should remember there is no language barrier, just human gesture that is universally communicative of emotions. In an interview with Julia Hoczyk, Scarlett mentioned he felt much of Chopin is musically breathed and phrased in a rather different way compared to say the logical structure of Stravinsky in the Rite of Spring. This more abstract 'absolute music' presents unique challenges for a choreographer. He was interested in expressing through the beauty of the dance, the pure emotions and special qualities and characteristics of the later E minor concerto Op.11 that distinguishes it from the earlier and shorter F Minor Op. 23. The noble Allegro maestoso opening of the first movement gives way to a lustrous cantabile of the most refined feeling one could imagine. 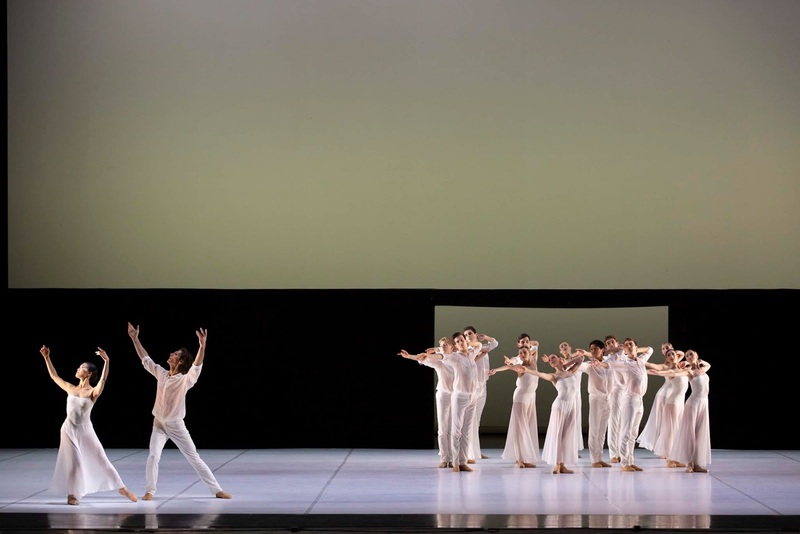 I felt the almost minimalist staging with the dancers in the simplest of white costumes - females in diaphanous long dresses transparent from the waist down, the male dancers in simple white trousers and sheer white shirts - was visually and aesthetically finely balanced, the large stage offering tremendous scope for movement. The choreography was subtle and refined, perfectly in keeping with the youthful emotional landscape of this concerto. Chopin was considered the 'Ariel of pianists' (the disembodied spirit character in Shakespeare's The Tempest) and I felt the dancers communicated this spirit of Nature most effectively. The Romanze. Larghetto is a ravishing love song with all the character of what might be considered a Chopin 'nocturne'. Danced in this vein, I found it moving and affecting, full of charm and refined passion. Perhaps the orchestral players occasionally struggled with the musical compromises necessary to imbue it with a tempo that could be danced but the music and dance breathed. The pianist Krzysztof Jabłoński was highly poetic and emotionally moving in this movement. Here was the true nature of adolescent love, cloudless and illusioned before the tigers of experience begin their feast. The breath of young idealistic love unsullied. The Rondo. Vivace was just that, a 'brilliant', lively and energetic krakowiak dance but naturally not presented as a folkloric celebration but one full of joy, élan and athletic exuberance on the part of the dance company, utilizing to the full their formidable technical resources. For me the performance expressed a perfect understanding of what a musicologist might term 'the Chopin aesthetic'. In modern interpretations and pianism there seems to be a movement to eclipse or at least diminish the 'feminine' aspect of the soul from Chopin. This is absurd and impoverishing and comes from our current preoccupation with the physical and crudely 'powerful' in life, the clichéd view of 'masculinity', the 'macho' male. Chopin was one of those rare individuals who managed to balance his masculine and feminine natures - a quality ever present in his music and something the choreographer Liam Scarlett seems to be profoundly aware of. The pianist Krzysztof Jabłoński , elevated above the orchestra on a thrust stage, gave a very fine performance of this concerto, one of the finest I have heard from him. He played with ease, authority and in perfect synchronization with the dancers which would not have been particularly easy requiring stamina and in addition concentration on these distracting external elements (as if the concerto itself is not difficult enough!) in a work of this length. 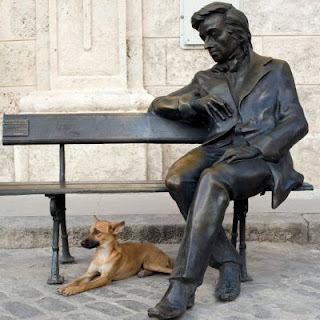 The style he adopted was very much in the correct style brillante of the day, fully embracing the climat de Chopin. The conductor Grzegorz Nowak and the Orchestra of the Teatr Wielki - Polish National Opera were similarly well attuned to the dancers although I imagine they have not performed this concerto all that often let alone with a ballet company. The rather different danced interpretation of the F Minor concerto by the renowned Polish choreographer Krzysztof Pastor is fascinating to examine. In many ways his conception indicates the characteristics of natural intellectualism and committed historicism that invests much of Polish creative thinking. One is very conscious of the weight of history living in Poland. Pastor felt the idea posed some less obvious questions beyond music that concerned both patriotism and history. He even employed the assistance and advice of a playwright (Daniel Przastek) as an historical consultant to work on a realizable 'plot'. Again this unusual approach was prompted by the absence of a narrative structure in the concerto. Its musically fitful emotional nature had to be taken into account. This ballet makes references to Polish post-war history in an aesthetic, abstract way rather than through the cold concrete nature of descriptive language as a book might. Pastor is fascinated by the films of Andrzej Wajda such as Kanal, They Loved Life and A Generation. 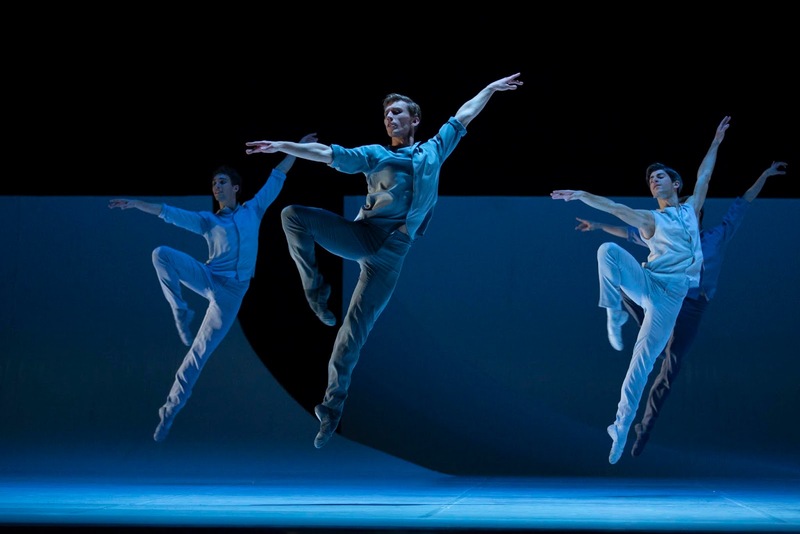 This is clear from his seminal ballet And the Rain Will Pass... with music by Górecki and his ballet Kurt Weill. The universal nature of the music of Chopin attracted him to creating a ballet that might be eventually considered for inclusion in the permanent repertoire of the company. He wished to combine the abstract with some sense of structure, so used the colour of the costumes to add a type of visual narrative and interpretative scaffolding to the whole. The Scarlett concerto was minimalist monochrome in dove grey and white. Here changes of costume indicated historical evolution as the work progressed. White denoted idealism or purity, a period of rebuilding the nation after devastations of war. Red - a colour from the national flag as well as the colour of the socialists and communists in period. Funereal black has obvious connotations for the tragic history of Poland but especially 1956-1968. Finally the gold of the 1990s, a reference to the consumer society intent on the golden calf at the expense of moral values. Concerning the collaborative role of the playwright and man of the theatre Daniel Przastek, he asked him to imagine an idea behind the music. Pastor wanted to avoid pure dance, the characteristic of all other Chopin ballet settings. It must be remembered that suffering, that ubiquitous and intense Polish emotion, has been alleviated in many individuals by periods of happiness, love, hope, joy and humour. He wanted to express these various conflicting moods and emotions through the choreography and especially in the varied lighting patterns of the white canvas stage. There are also elements of improvisation in Pastor's characteristic mélange of classical and modern ballet styles of choreography. In the Maestoso first opening movement of this, the first concerto Chopin composed, the balletic expression swayed correctly between classical detachment and romantic enthusiasm. The main theme of the exposition in the rhythm of a Mazur was well preserved and the development was a flurry of activity. The style brilliant came off spectacularly well with the pianist Krzysztof Jabłoński. Hints of the Larghetto were subtly expressed in a touching cantabile. The Larghetto itself, 'indescribably beautiful', avoided any sort of cloying sentimentality in the danced interpretation. Strength was supplanted or even augmented by visual poetry. So many levels of expression were present here. The explosions of emotion in the Chopin directions con forza and appassionato were utterly appropriately danced, presenting in gesture the expressive doubts and slightly angry emotions of adolescent or young love, so full of hope and illusions. 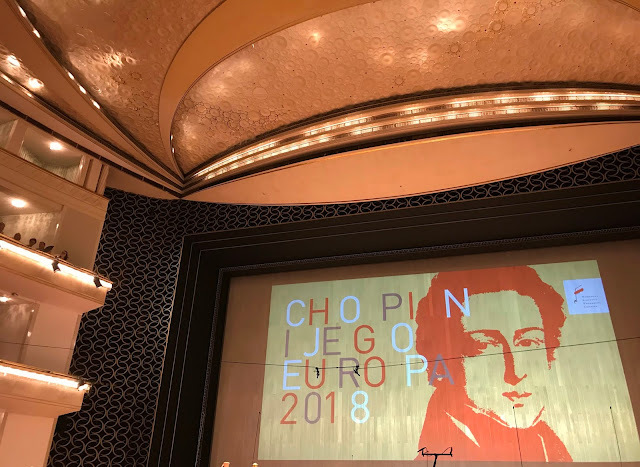 The emotional agitation that is embedded within the movement was approached with a strong response perhaps expressing Chopin’s frustration with the unrequited nature of his silent admiration of the soprano Konstancja Gładkowska. The controlled pianissimo final note, as the apotheosis of the structure, was beautifully communicated by the dancers. The Allegro vivace has its first theme marked semplice ma graziosamente followed by a sudden rush of temperament and slight accelerando which give an urgency to the music, eloquently expressed in the dance movements. Some bucolic merry-making of the jolly tavern type but never crude is coupled with that lovely and inspirational col legno pizzicato-like sound on the strings. We danced along delightfully towards the notorious natural horn call and the scintillating coda closing the work with a smile of pleasure. The movement revealed the orchestra in musical control under their conductor Grzegorz Nowak. The finely graded crescendos and decrescendos of the pianist Jabłoński was mixed with the youthful joy of Chopin exercising his compositional and melodic virtuosity to its utmost. The expressive choreography had become by now a type of eloquent sound painting with all the costume colour changes. The exuberant dance of the kujawiak provenance was wonderful in its physical energy, exhilaration and high spirits. Both ballets have given us such a marvelous outpouring of the optimistic young but essentially Polish Chopin – the dancer, pianist, actor, mimic, writer, practical joker and humorist – as well as composer of genius. At the conclusion, the new ballet Nasz Chopin danced all the way to the final overflowing joyful chords of this concerto, the expression of Chopin’s first love.